Robert Baden Powell created the Boy Scouts in England and 1907, bringing the idea to the east coast of America just three years later. Chicago Publisher, William D. Boyce, incorporated Boy Scouts of America on February 8, 1910. In 1912, the first Boy Scout troop in California was established in Lindsay, Troop #1. 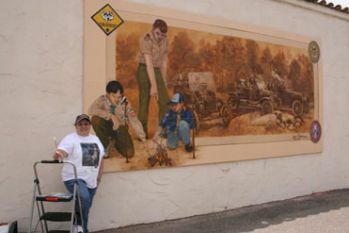 The Lindsay Mural & Public Art Society, with the help of Eagle Scout candidate, Josh Jones and Lindsay High School, completed the research and funding necessary to create a historical mural commemorating Lindsay’s Boy Scout Troop One. California based artist, Josie Figueroa, using acrylic paint on Dibond aluminum composite, painted the 8 by 16 foot mural. The use of a sign material and framing system allows the mural to be relocated at any time. 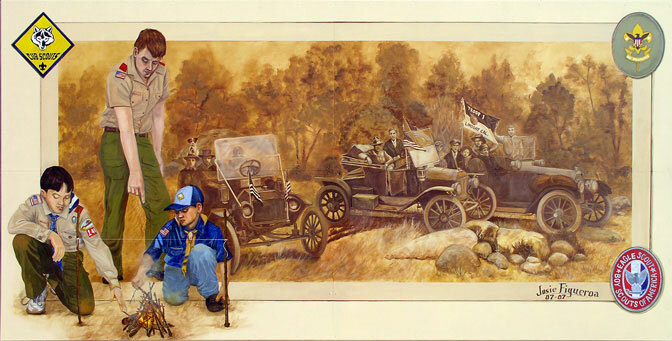 The mural depicts an actual Troop One outing in the Sierras in 1915. Today, the United States Boy Scouts has over a million members.